Kanye West (L) and JAY Z onstage at the Tidal launch event #TIDALforALL at Skylight at Moynihan Station on March 30, 2015 in New York City. 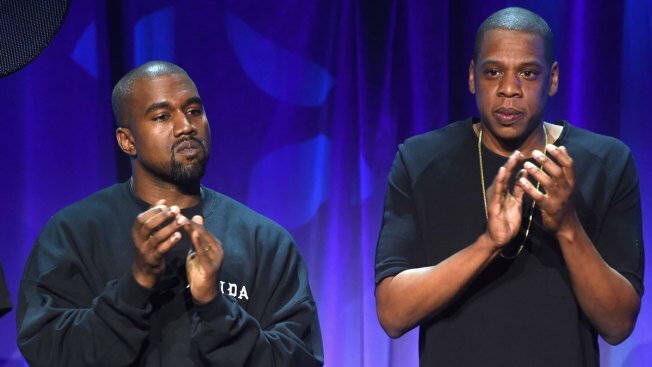 Jay-Z and Kanye West are slowly but surely making progress. In a wide-ranging interview with T, The New York Times Style Magazine, Jay-Z got candid about their fractured friendship, saying he hopes to resolve their issues when the time is right. Together, the superstars made the 2011 album Watch the Throne and later embarked on a co-headlining tour of Europe and North America. Last year, however, West revealed they were fighting behind the scenes when he went on an onstage tirade in Sacramento, lashing out at everyone from Beyonce to Mark Zuckerberg. The outspoken rapper eventually ended his concert after four songs, and two days later, West checked into a hospital for an eight-day stay. Jay-Z addressed their beef in his Grammy-nominated album, 4:44, while West has been out of the spotlight for much of the year. The rapper spoke to West "the other day, just to tell him, like, he's my brother." Jay-Z added, "I love Kanye. I do. It's a complicated relationship with us." How did it become so complicated? Grammys 2018: Are the Nominees Underwhelming? "'Cause, you know--Kanye came into this business on my label. So, I've always been like his big brother. And we're both entertainers," Jay-Z explained. "It's always been like a little underlying competition with your big brother. And we both love and respect each other's art, too. So, it's like, we both--everyone wants to be the greatest in the world. You know what I'm saying? And then there's like a lot of other factors that play in it. But it's gonna--we gonna always be good." Even if they get their egos in check, don't expect them to suddenly act like BFFs again. Jay-Z confirmed there is still tension. "But that happens. In the long relationship, you know, hopefully when we're 89 we look at this six months or whatever time and we laugh at that. You know what I'm saying? There's gonna be complications in the relationship that we have to get through. And the only way to get through that is we sit down and have a dialogue and say, 'These are the things that I'm uncomfortable with. These are the things that are unacceptable to me. This is what I feel.' I'm sure he feels that I've done things to him as well. You know what I'm saying?" Jay-Z asked. "These are--I'm not a perfect human being by no stretch, you know?" In spite of their differences, the "Story of O.J." rapper admitted West is a "highly evolved" musician. "I think he started out in a more compassionate position than me. You know what I'm saying? I don't know if he's had the level of--I mean, I had to survive by my instincts. I'm here because I grew up a different way," the Brooklyn native, 47, explained. "And I got out of that." "You know, my first album came out when I was 26, so I was already a different artist. You know, a lot of people's album come out they're 17, 18. So their subject matter is that of a 17- or 18-year-old. Unless you're Nas, and you like, well-read--like, he was way more advanced with the album that he wrote. So I just grew up a different way. But [West is] a very compassionate person. And a lot of times he gets in trouble trying to help others. So, I can identify with it. It's just that there's certain things that happened that's not really acceptable to me," Jay-Z shared with The New York Times. "And we just need to speak about it. But there's genuine love there." Original Post: Jay-Z on His "Complicated" Friendship With Kanye West and Their "Underlying Competition"